10 Banbury Harriers travelled to Keysoe nr Bedford for the penultimate round of the Chiltern League. This is the second largest cross country league in the country with over 1000 athletes competing. Held on a horse cross country course with the water included, and a strong wind to contend with, it was a tough event. Isla McGowan has showed great consistency this season, and of the 70 U11 girls in the race came home in 4th place, just 13 seconds behind winner Isabella Haines-Grey from Oxford City. Charlotte Hall also had a good run in 16th place. Tilly Lainchbury has also had a consistent season, and on an energy sapping uphill finish showed some good pace to overtake 2 runners and finish in 15th place. This leaves her in second place overall of the Division 2 clubs. 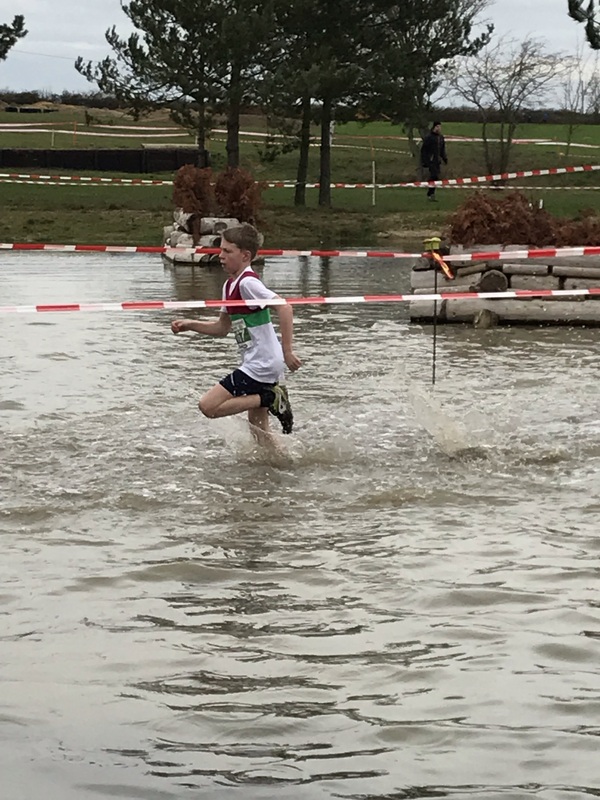 Sam Davis enjoyed the water feature, despite it being bitterly cold, and his 37th position of the 80 U13 Boys bodes well for next season when he will be top of his age group. U17 Girl Katie Pamphlett had a great first lap and was heading for a top 20 finish, but slowed a bit on the second lap due to stomach cramps and came home a satisfied 27th place. Not to be outdone by their younger counterparts the masters athletes had some fantastic results. Of the 252 finishers in the senior ladies race Michelle Bartelett was first Banbury Harrier home in 44th place, and 4th F45. Ros Kelling, improving as the season progresses was 50th and first F55. Lisa Ansell returning well after injury and illness showed an amazing turn of speed in the finishing straight to finish 129th and 16th F45. In the usual large senior mens field of 384 runners Phil Coy was 316th and Glynn Pritchard 363rd – 9th M60 and 2nd M70 respectively. With the last round of the Chiltern League to be held at Milton Keynes on February 9th there should be a number of Banbury Harriers collecting awards in Division 2 for their hard work this winter. photos are of Isla McGowan Tilly Lainchbury & Sam Davis.